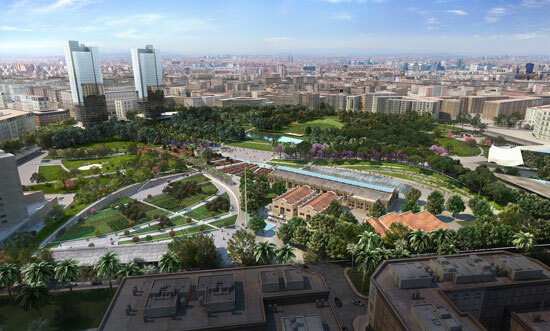 Leading landscape architects Gustafson Porter have won a high profile competition to design the Valencia Parque Central. 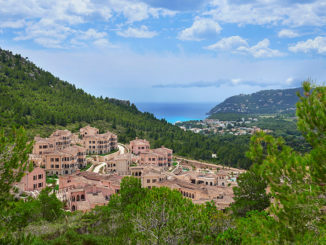 The winning project “Aigua Plena de Seny” was developed by an international multi-disciplinary team which is a joint venture led by Gustafson Porter and includes Borgos Pieper architects (London/ Barcelona), Nova Ingeniería Project Management and Grupotec Engineers from Valencia. The international competition initially drew 36 teams from eight countries. 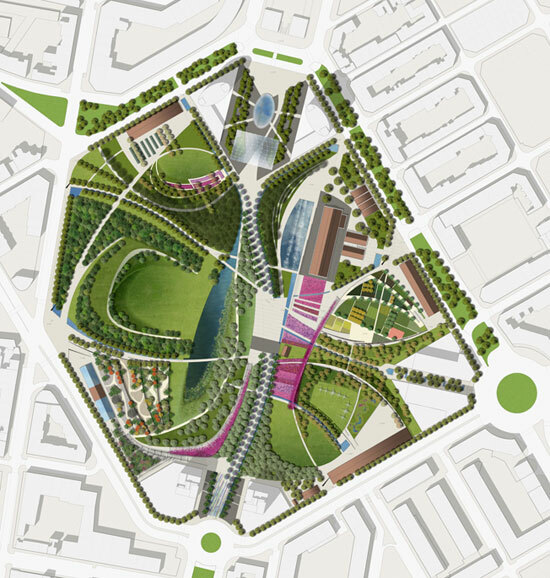 The five short-listed design teams to submit a master plan at the final stage of the competition also included Foreign Office Architects, Zaha Hadid Architects, Rogers Stirk Harbour +Partner and West 8 Urban Design & Landscape Architecture. The designs were judged by a jury comprising prominent members of the local architecture and landscape community and the Mayor of Valencia, Rita Barberá, who announced the winning design of the international competition on 25 January 2011. With a total surface of 66 hectares and an investment of 73 million Euros, the Valencia Parque Central project is, according to the Mayor Rita Barberá, “a historical milestone of the city’s urban development” and “the most attractive, important and certainly the economically most significant project in Europe”. The Valencia Parque Central project covers the central urban area affected by the arrival of high speed trains to Spain’s third largest city. The new contemporary public park is made possible by the tunnelling the existing railway lines below ground. 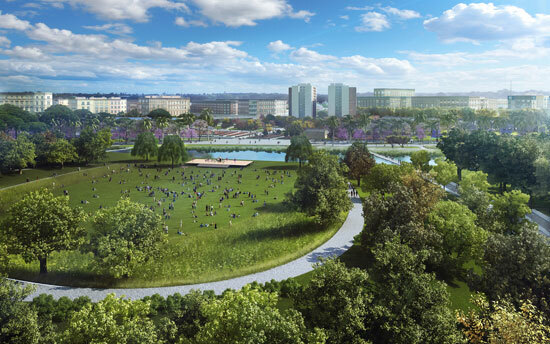 More than half of the available site will be planted, and a new 23-hectare Central Park will become the heart of Valencia’s most important redevelopment project to date. The design celebrates the landscape and culture of the Valencia region and builds on Valencia’s unique location between ecological habitats: the Turia River reserve, the agricultural plain (La Huerta), the Albufera natural park and the Mediterranean ‒ resulting in its role as a major European trading and cultural centre throughout history. 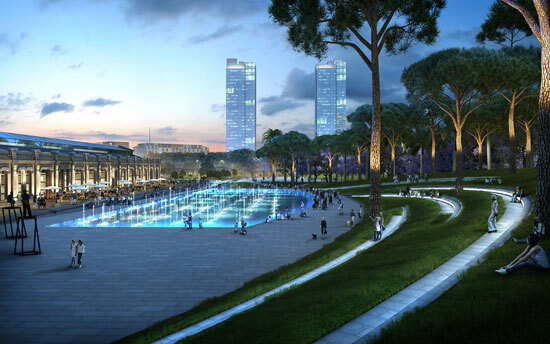 • Arts Plaza ‒ Existing refurbished buildings, Art Centre, Library, Visitor Centre and Café, and a natural amphitheatre frame a spectacular water feature and form one of the poles of attraction of the Park. • Huerta Garden ‒ Planted terraces suggest the historical agricultural tradition of the Valencia region (Huerta). • Flower Garden ‒ Formalized avenue around Alquería historic building framed by colourful flowers. • Children’s Garden ‒ Offering flexible space for play areas serving different age groups. • North Plaza ‒ Featuring a large water feature and spectacular canopy. 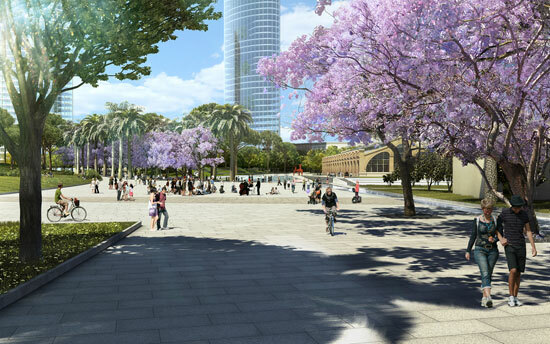 • Central Plaza and North-South Promenade ‒ Promenade of palms and jacarandas, opening to a central square and acting as a link for all the main pathways of the Park. 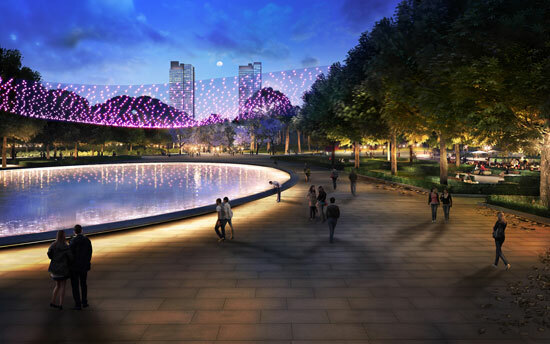 • South Plaza ‒ Featuring an atmosphere of movement and speed created by linear lights and projections to treasure the site’s historic memory of travel, trains and journeys. • Exhibition of Mediterranean Gardens ‒ A new glass house next to a terraced landscape of Mediterranean plants constitutes this second pole of attraction. 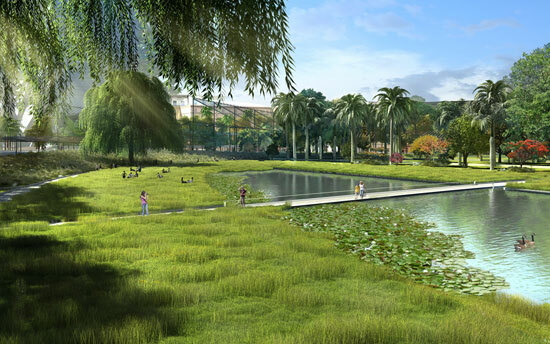 • Amphitheatre ‒ Sculpted park forming a natural amphitheatre with a large lake of natural water and aquatic plants creating space for picnics and gatherings as well as informal seating during performances and concerts. • Perfume Garden ‒ Garden dedicated to Mediterranean fragrances and scents.